Because of the clarity of this photo, I thought I would post it again. Click on image to Enlarge and/or Download. Enjoy! 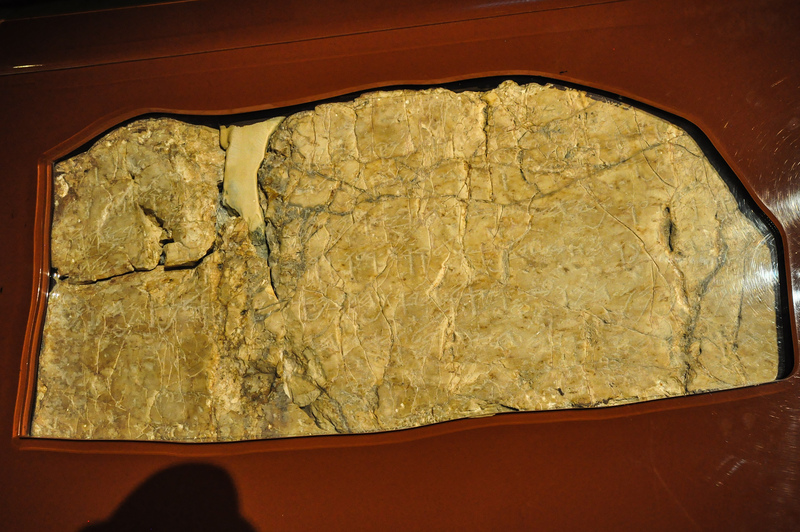 On a trip to Turkey I was able to rephotograph the Siloam Inscription from Hezekiah’s Tunnel in Jerusalem. In the past I have found it difficult to photograph because of the glass cover over it and difficult lighting conditions. This time I think my photograph turned out quite well and by clicking on the image you can actually read many of the letters. This six line Hebrew inscription describes the digging of Hezekiah’s Tunnel that joins the Gihon Spring and the Pool of Siloam in the ancient city of Jerusalem. It was found carved into the wall of the tunnel. In was found in 1880 and was chiseled out of its original place and is now on display on the second/third floor of the “Archaeological Museum” in Istanbul. It’s language, script, and content suggest that it was inscribed in the late eighth century during the reign of the Judean king Hezekiah (715–686 B.C. ; see 2 Kings 20:20; 2 Chron 32:20). For a translation of this text see pages 171-172 in Arnold, Bill T., and Beyer, Bryan E. eds. Readings from the Ancient Near East: Primary Sources for Old Testament Study. Grand Rapids, MI: Baker Books, 2001. Click Here to view for purchase from amazon.com.